Those who have attended a Williamsport Croscutters (Short Season A; New-York Penn League) game at BB&T Ballpark at Historic Bowman Field this season have been in for a unique experience — one that will be shared nationally when the ballpark hosts the MLB Little League Classic Sunday. Though the longstanding characteristics of the historic ballpark are familiar on many levels—from its intimate confines, to its classic look and feel—new amenities have led to a more modern gameday experience. Prior to this season, the Crosscutters completed several renovations. Logger’s Landing, a new premium deck, was added down the first base line, while new seats were installed on both levels of the grandstand. Yet, it was upgrades to player amenities that have perhaps received the most attention, as those will help the ballpark accommodate the MLB Little League Classic. A regular season matchup between the St. Louis Cardinals and Pittsburgh Pirates on August 20, the MLB Little League Classic will mark the arrival of major league action to BB&T Ballpark at Historic Bowman Field. For the Crosscutters, the transition from planning early renovations to being in the position of hosting the game was a gradual process. “It was really a confluence of events that allowed it to take place, and it really just started with our premium deck down the right field line,” said Gabe Sinicropi, Jr., the Crosscutters vice president of marketing & public relations. Construction on Logger’s Landing began before the 2016 season. 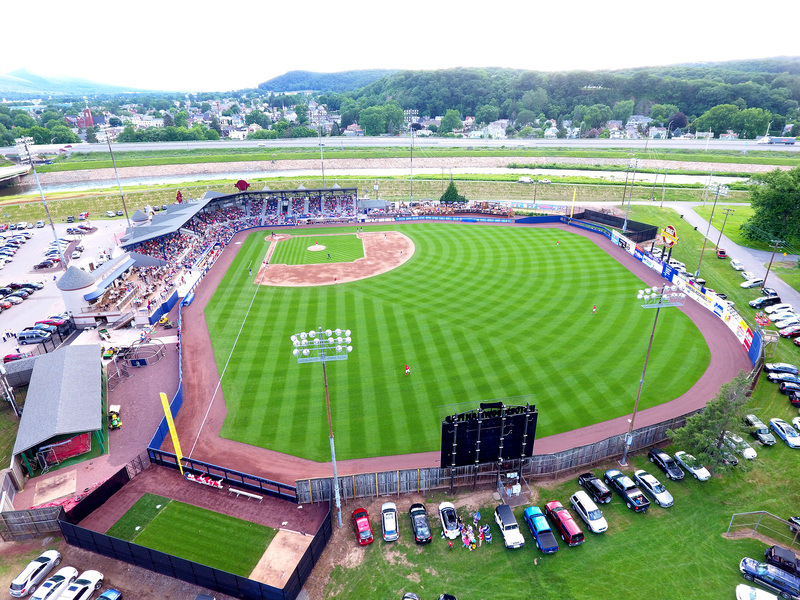 The Crosscutters later announced a $1.25 million grant from Pennsylvania’s Redevelopment Capital Assistance Program, which helped pay for first-level seating upgrades and new dugouts. The Crosscutters, along with River Valley Transit, and a grant from Lycoming County Visitor’s Bureau paid for second-level seating. It was in March 2017 that the MLB Little League Classic was announced, and MLB paid for a replacement to the playing surface and irrigation system as well as the relocation of the bullpens from foul territory to areas beyond the outfield wall. In all, the total investment in BB&T Ballpark at Historic Bowman Field upgrades amounted to $4 million. BB&T Ballpark at Historic Bowman Field certainly has the background to solidify the use of historic in its name. Opening in 1926, the ballpark is the second oldest among active Minor League Baseball facilities, and retains a classic look in many areas. When planning the renovations—particularly Logger’s Landing—the Crosscutters wanted to keep that trait in mind. With its extensive rail seating, wide array of food and beverage offerings, and other offerings, Logger’s Landing offers many features fans have come to expect at today’s ballparks. Its aesthetics, however, are shaped by architectural materials identical to those used in a renovation to the main entrance of the ballpark that took place 17 years ago. “When we were building that deck, we were incredibly mindful in saying we can’t build a futuristic spaceship on one side of the stadium,” Sinicropi recalls. “It’s not going to mesh with the rest of the stadium. For Sunday’s game, the Crosscutters will some serve key roles around the ballpark. As Sinicropi explained, the team will run food and beverage operations for the night, handle front gate operations, and do most of the ushering. Top image courtesy Williamsport Crossuctters.